Excellence, Friendship and Respect: These are the values which the Olympic Games celebrate. But sometimes our Friendship and Respect values take a backseat to our own patriotic Excellence. But we mustn’t forget that the the Games foster connection and sociability among fans. It is an experience that is shared and sharable, providing many with the opportunity to be a member of the global community. Let’s rally to make this the friendliest Olympic Games yet by shining a light on those that are looking beyond the podium and truly celebrating the power of the Games: “an interplay between countries that represents the best in all of us.” We’ll discover, hero and reward the most “sportsmanlike” countries by analyzing the language used in Tweets, Facebook posts, and other social media related to the Olympics. 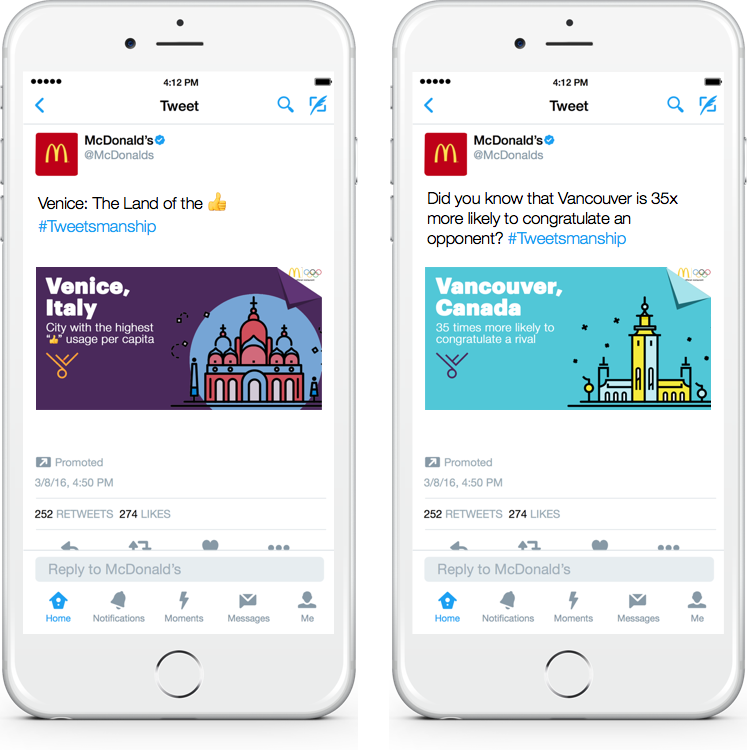 Leading up to the Olympics, McDonald’s would launch a data-driven content series uncovering interesting #Tweetsmanship factoids/stats: the cities with the highest affinity to each other, the ones to use the 🙌 emoji the most, the most congratulatory, etc. 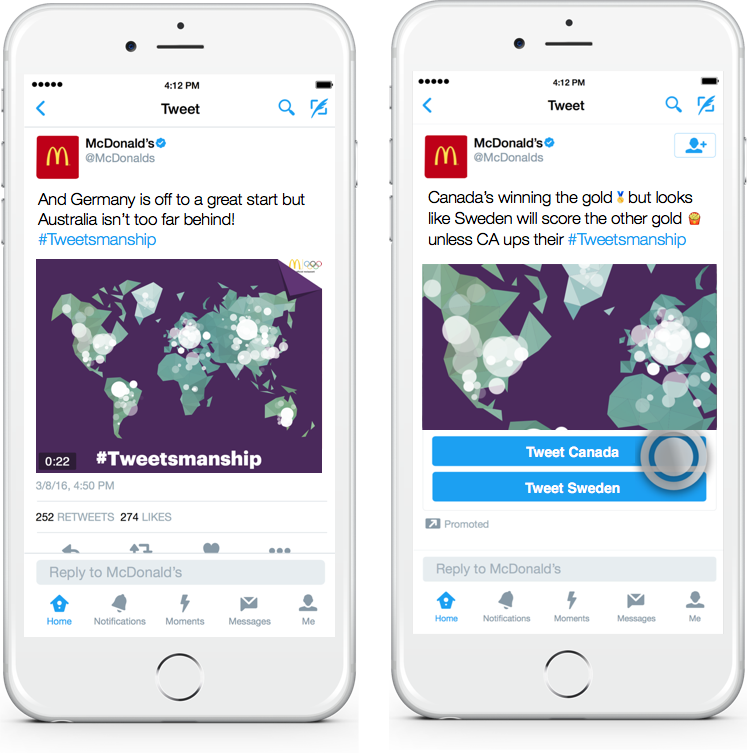 During the Olympics, global #Tweetsmanship sentiment would be tracked live, visualized in daily heat map recap tweets, and countries would be ranked on a leaderboard that would appear on McDonald’s owned digital platforms. People would be able to monitor their regional/local sentiment by tweeting #Tweetsmanship + the country flag of their choice. They would receive an autoresponse with a heat map visualization of their country and/or city and where it stood in the leaderboard. 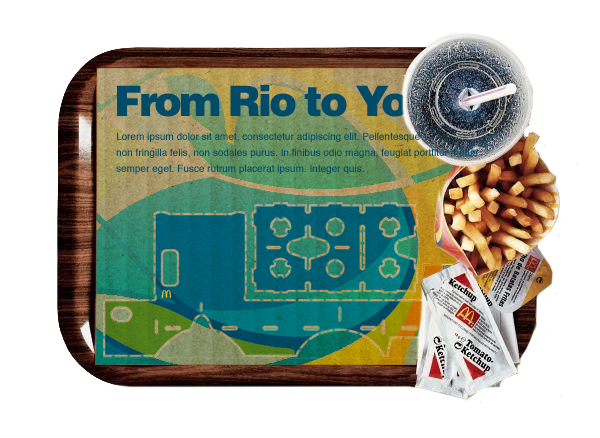 At the Olympic Village, we’d be at the ready for fans in-need of their country’s handheld flag – but ours would come with a friendly twist. We'd turn our digital submissions into physical ones by live printing #Tweetsmanship from other countries on the corresponding country flag (e.g. tweet praise from Russia on a US flag). So not only would you be waving your flag in support, a supportive rival across the world would be waving with you. Pictures of the flags in Rio would also be tweeted out to the original submitter. Because we wouldn't be able to turn every #Tweetsmanship into a flag, we’d invite the world to create a living, 3D-printed world map art installation of #Tweetsmanship with us. The world map would be drawn out, and every time someone tweets with the hashtag, a layer of filament would be 3D printed on top of the corresponding location from where it was tweeted. Eventually, the 3D-printed world map would have colorful peaks and valleys illustrating sportsmanship around the world. 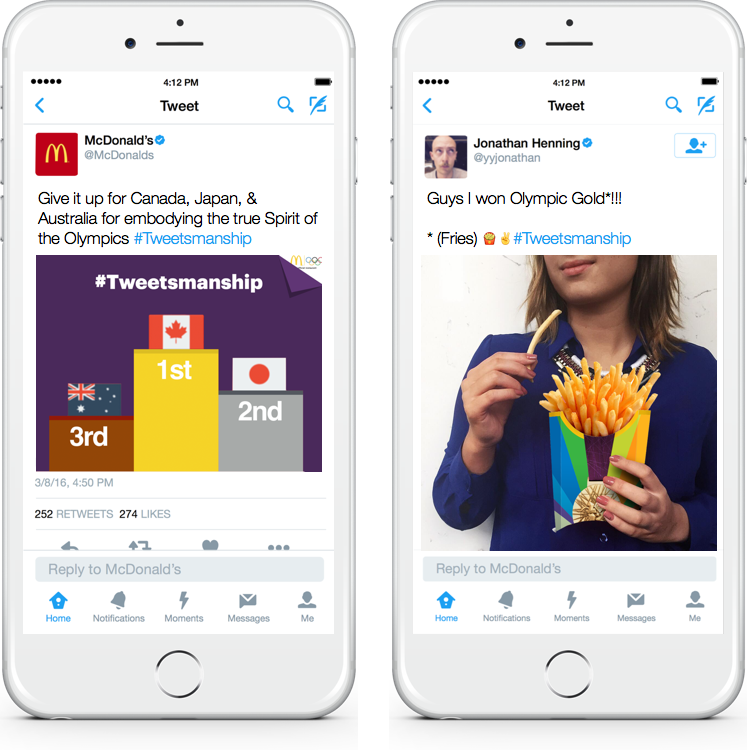 McDonald’s would wrap up with a #Tweetsmanship report / final rankings and hero UGC from winning countries claiming their Olympic Gold(en) fries. Using 360 degree cameras and Google Cardboard Virtual Reality (via in- store cardboard tray liners), we'll make it possible for anyone, anywhere to feel like they're in the Olympic festivities in real-time – not just watching it. 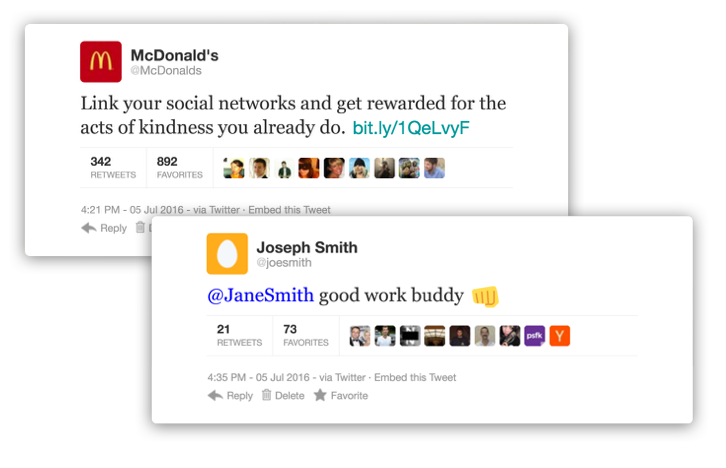 Our @McD_FriendshipBot would auto-tweet participating players after unlocking a badge and let them know how many more acts are needed to redeem a prize.